Rita Shane (August 15, 1936 - October 9, 2014) was a dramatic coloratura soprano notable for her performances in opera. She studied at Barnard College and under Beverly Peck Johnson, and made her operatic debut as Olympia in Les contes d'Hoffmann, at Chattanooga in 1964. The next year she appearing with the New York City Opera, as Donna Elvira in Don Giovanni. Her performance in the 1971 live recording of Les Huguenots was described as "borderline astonishing" by reviewer Charles Parsons. With the New York City Opera, Shane went on to sing in Dialogues des Carmélites (as Mme Lidoine), L'amour des trois oranges (as Fata Morgana), Don Giovanni (now as Donna Anna) and Die Zauberflöte (Queen of Night). She debuted at the Metropolitan Opera in 1973, as the Queen of Night. Over eight seasons, she also sang in La bohème (as Musetta), Un ballo in maschera (as Oscar), Le siège de Corinthe, La traviata, Lucia di Lammermoor, Le prophète (as Berthe, in John Dexter's production), and Rigoletto. 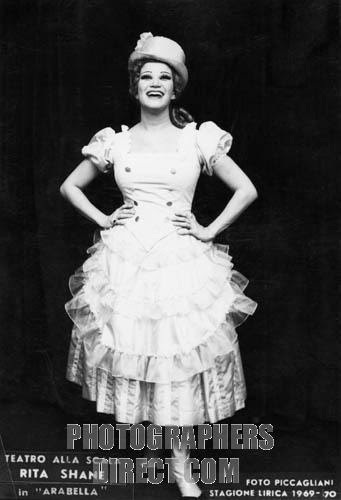 She returned to the New York City Opera in 1979, creating the title character in Dominick Argento's Miss Havisham's Fire, and singing in La traviata, as well. Later, she sang Dircé in Médée (in the Italian version) and Giselda in I lombardi alla prima crociata with that company. For the New Orleans Opera Association, she appeared in La Juive and Les Huguenots. Shane performed in Milan (Teatro alla Scala), Vienna and Munich. At Salzburg, in 1972, she was applauded for her performance in Schönberg's Erwartung, with Michael Gielen conducting. The soprano has recorded excerpts from Handel's Athalia and Rinaldo. From 1989 to 2014, Shane was on the faculty of the Eastman School of Music.